I believe love is the ultimate form of activism, the ultimate good thought, embodied through action. Because when we love someone (two-legged, four-legged, winged, rooted or finned), there will always be times when that love is challenged. Today my heart is full of honeybee love, which makes my world go round. Love suffuses everything we do and guides us. It calls out reverence and devotion in us and shines a light on our essentially benevolent and generous nature. It is why we grieve any bee or dog or cat or horse or tree that ever dies in our care as we move from our first awkward years of stewardship, towards competence then grace. And it will bring us to our knees the first time this “sacred other” goes silent, when we simply can’t believe they died because we loved each other so profoundly. One of my beloveds, Tusacarora elder Ted Williams, always reminded me of the importance of our good thoughts. He said we really only have four things in life: our good thoughts, good feelings, good words and good deeds (and that they are important in that order). Good deeds can be challenging enough but we all know what it is like to try and herd our cat-like thoughts on any given day. Whew. It can be extremely humbling to live within the monkey-filled field of the small sacred things, because we don’t always see the change we are part of, manifested in our lifetime. Our thoughts have power. Remember that wonderful 100th monkey thing? That phenomenon in which one (usually very simple) thought or behavior passes from one individual to another and eventually suffuses a group, achieving critical mass and catalyzing a seemingly instantaneous change that is then available to the rest of the population? A new norm is born and takes up residence in our minds and lives, like it’s always had a room in our house. It can be extremely humbling to live within the monkey-filled field of the small sacred things, because we don’t always see the change we are part of, manifested in our lifetime. My grandfather told me that he knew he wouldn’t live to experience equal and civil rights in our country. And he didn’t. But he believed in them and acted accordingly. I believe we all see some of the effects and fruits of our labor in our lives. And at other times, I think we are asked to faithfully offer our thoughts and actions up to the great great grandchildren we will never see the faces of. So much of this requires just simply doing the right thing (and especially what feels right to us). Many of our efforts will be un-thanked. But I don’t think we are ever confused about what matters if we are really paying attention. 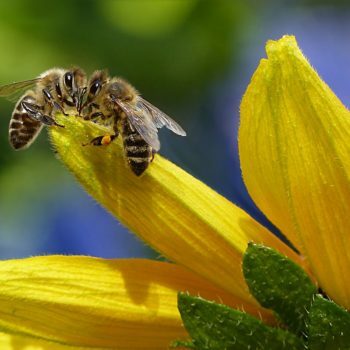 In our heart of hearts, the welfare of all life, bees and all, matters. When I look back on years of talking about bees with children, I would say the single thing that most impressed them was my love for honeybees. I believe love is the ultimate form of activism, the ultimate good thought, embodied through action. Because when we love someone (two-legged, four-legged, winged, rooted or finned), there will always be times when that love is challenged. We will disagree, misunderstand, insult, mistrust, irritate, betray, get bitten, hooked … and stung. And sometimes our beloveds will die. And then (big Medicine of all medicines) we can (and I believe have to) choose to love again … and again. And we do so because well, we love this other and like how that feels back. When I look back on years of talking about bees with children, I would say the single thing that most impressed them was my love for honeybees. 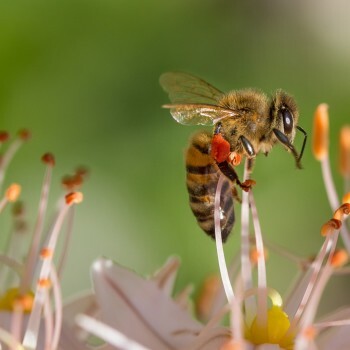 That an adult could stand up in front of them and publicly and passionately love honeybees as much as they love their dogs, cats or grandparents, was a revelation (especially an adult bedecked with antennae and wings). So love the bees or at least love who you love so passionately that it wells up and out of the cup of you like a great, warm, honey-ed libation, pouring over all of life (which happens to include the bees and everyone you care for). Prepare to fall in love more than ever you thought you could, for love will do its work and love will bring us home sweet home. Debra Roberts is a natural (treatment-free) beekeeper and international honeybee educator, speaker, mentor, advocate, artist, and writer. She is Founder of Holy Bee Press, Vice President of The Center for Honeybee Research, Founder of The Honeybee Project, a bee mentor for Hamaatsa (an indigenous learning center in New Mexico), editor of a series of ongoing articles about honeybees and natural beekeeping, on the Steering Committee of Bee City USA, and received her Master Beekeeping certification in 2010. She is founder faculty of The College of the Melissae: Center for Sacred Beekeeping in Ashland, Oregon and was chosen as one of the Heroes of Asheville in 2014. 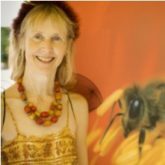 She also created the online series, The Sacred Path of Bee for bee appreciators worldwide. Thank you for this beautiful reflection. As someone who is often caught up in trying to “be better at what I do”, I really appreciated the reminder that the LOVE we put into what we do is the most important thing. This is a reflection that I plan to come back to and reread periodically when I get too caught up in the “not good enough” mode. It’s amazing. I have a slight phobia of bees, but the more I read about other people’s appreciation of them and the science of the evolution and adaptive behaviors of bees, the more I feel grateful for them. I am at the point now where if a bee is near me, I still get the butterflies, but now I don’t run away, and, at a distance, I look at them with love and gratitude.